More than one million people flocked to celebrate at this year's gay pride parade, the first since marriage equality took effect in Illinois, officials said. The 45th Annual Chicago Pride Parade stepped off at noon on the city's North Side and snaked through the Uptown, Lakeview, Boystown and Lincoln Park neighborhoods. Traffic restrictions and street closures took effect around 7 a.m. Sunday as revelers began to line the streets. Chicago police warned that no alcohol or rooftop parties would be allowed along the route and those caught drinking on the sidewalk, street or in an alley or park face a fine of $1,000. Preparations are underway for Sunday's Pride Parade. Street closures will begin at 7 a.m. with the parade kicking off at noon. Hundreds of thousands are expected to line the streets for the celebration. NBC5's Regina Waldroup reports. Some parade-goers, however, reported that the crowd at times became rowdy. Kristen Linscott posted a photo to Twitter showing crowds sitting and standing on a squad car with a broken windshield. The Chicago Transit Authority said Red and Brown Line trains bypassed the Belmont Station near the parade for nearly two hours after "crowded conditions" and police activity prompted safety concerns. "Over 1 million people attended today's parade," Chicago Police said in a statement. "Despite the large crowd, there were only a handful of issues including eight arrests, one of which was for criminal damage to a police vehicle." Gov. Pat Quinn was among those in attendance at the election-year parade and was celebrated for his efforts in legalizing gay marriage. 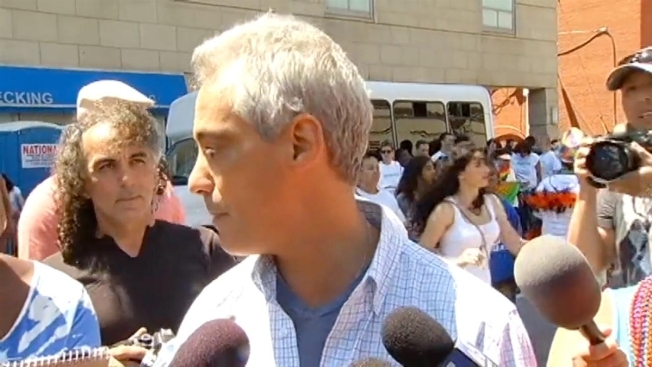 Several other politicians marched in the event including Chicago Mayor Rahm Emanuel, Lt. Gov. Shiela Simon and Rep. Greg Harris, who sponsored the gay marriage bill. "For the first time this year, there are thousands of families who are going to be walking with us in the parade who are now legally married," Harris said. "This year for Illinois all families are equal and it's a really wonderful year." Four couples celebrated marriage equality at the parade by getting married on a float. "What a wonderful wedding reception," Art Johnston, co-founder of Equality Illinois, said. "How wonderful to have a million people at your wedding."